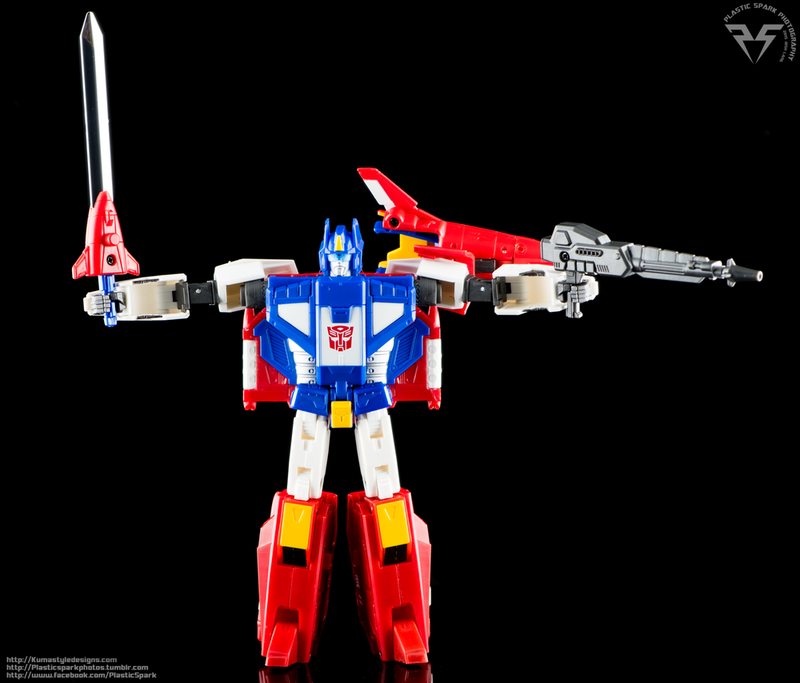 Star Saber is made up of 3 parts. The smaller Brainmaster of Courage who does not transform, a smaller fighter jet style transtector called Saber, and the larger V-Star ride armor that he combines with to create Star Saber. Saber’s jet mode is a red and white space style jet combining elements of earth style fighter jets and more anime inspired space fighters. In the anime he is shown to be able to handle both in and outside of the atmosphere with or without the V-star, however his speed is greatly increased when combined. The jet mode is fairly clean from the top, with a lot of nice white detailing breaking up the masses of red plastic and twin Autobot sigils on his wings. The wings and tailfins can all fold up for transformation but you can also use them to portray a stationary “grounded” mode for the jet. From the bottom he is a bit messier, an unfortunate trait shared by almost every single official jet transformer masterpiece or otherwise. You can very clearly see the chest, arms and legs of the robot when viewed from below but really why are you looking at your toys upside down? He has flip out landing gear under the nose cone and the rear of the jet and you can flip the intake vents behind his cockpit to be smaller red vents or larger grey vents to your liking. Technically this is for the transformation to the full combined robot but you can utilize the feature in alt mode if you prefer one over the other. The V-Star ride armor shares many of the same traits with folding wings, tail fins, and flip out landing gear. The vehicle is primarily blue and white in contrast to Saber’s primarily red jet mode. The V-star doesn’t do very much on its own. It has a clip that can hold the Star Saber helmet to form a sort of front mounted turret and Saber can stand atop it in robot mode just like in the cartoon (though the scale is a bit skewed compared to on screen depictions). All the rear thrusters on the V-star and Saber are die cast parts and can be slightly adjusted though the visual appearance of them when moved is fairly underwhelming. With the wings and tailfins of Saber folded properly he can be inserted in to the front of the V-star to form the combined alt mode of Star Saber. 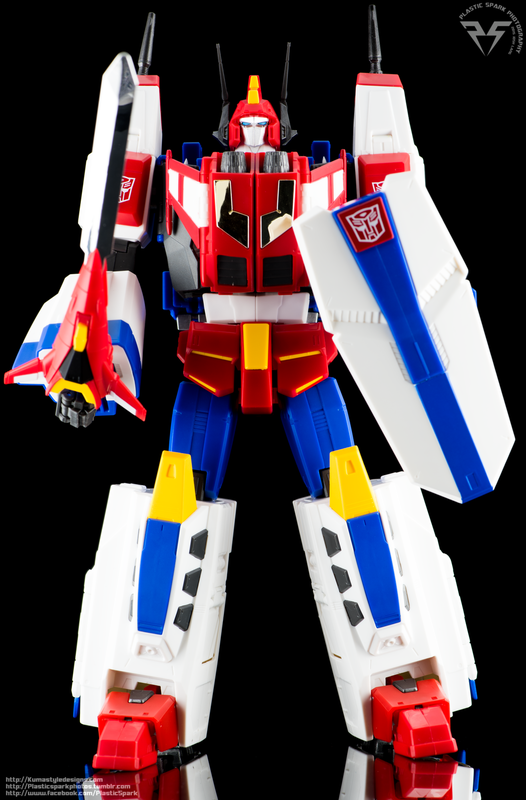 In this combined mode Star Saber is one of the fastest Transformers in series lore and can achieve space flight speeds as good as or greater than full on Cybertronian starships. In the combined mode the landing gear can still be deployed and he also comes with a flight stand formed from the robot mode shield and optional translucent stand parts. The flight stand does a good job of holding Star Saber off the ground just enough to add some dynamic style to your display shelf if you are keeping him in alt mode. 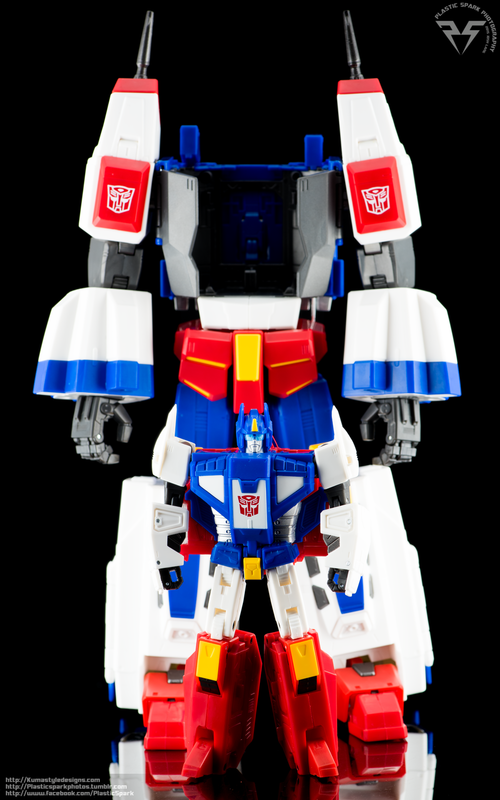 The combined mode is very large and carries quite a bit of weight thanks to the addition of die cast parts in the booster and feet of Star Saber. While he displays well on the flight stand I do find the weight puts a bit more tension on the landing gear parts than I would like and I don’t really feel comfortable leaving him displayed without the stand. Now for the good part! Let’s start with the basics again, Saber and the Brainmaster of Courage. The Brainmaster is a basic, little, semi articulated robot. He has pin swivel shoulders and hips, just enough to stand up straight, or sit down in the cockpit of the Saber Jet. He is painted fairly well for his size and really makes me wonder why Takara continues to release small human figures with unpainted faces when they clearly have the ability to paint a figure that is as small if not smaller than the Spike figure included with MP10 and Raul with MP25. Saber’s chest opens to reveal the Brainmaster elevator and when the Brain of Courage is inserted and the door closed it will push the face and visor up into Saber’s helmet completing his transformation. Saber has a fairly simple robot mode. He is a bit small for the leader of the Autobots but the scale is fairly accurate to the cartoon. He stands just ever so slightly taller than MP12 Lambor in robot mode and fits in quite well with the Masterpiece cars. While this scale for robot mode certainly works well, it does seem a little strange when you stand him next to any of the MP11 Seeker molds and they tower over him. His articulation is a bit limited due to sacrifices made for the combined robot mode. He has ratcheted joints for both his hips and his knees. They are both on swivels as well meaning that if you want him to stand in an A-stance or any sort of dynamic posture you have to turn his thighs to allow the legs to go outwards. While this achieves the intended effect it does leave him looking slightly disjointed and strange from certain angles. His lower legs are all one piece meaning there is no ankle tilt, his feet can hinge upwards a little bit due to transformation, but any thoughts of using them to allow for a walking or running pose go out the window when you realize how little it takes for them to fold back up into the legs. He could really use some better ankle support as well as he has a tendency to fall backwards and with the inaccuracy of the ratchet joints he has for thighs and knees getting him into a natural standing posture can be a nightmare. His arms have a similarly handicapped design in order to allow for the necessary transformation to take place. He has an up and down movement in the shoulder due to transformation and a ratchet joint to allow for front and back movement of the arm. The arm is unable to go full 360 degrees due to Saber’s wing kibble on his back hindering some movement. Natural poses are still achievable but Saber takes a lot of fiddling to get him looking just right. Due to transformation he is left with large gaps in his forearms as well. If the tiny gaps in MP Bumblebee’s arms were upsetting to you I might advise to look away when transforming Sabers arms for fear of trauma. His wrists have swivels that can be used to achieve a more natural stance when posing with the smaller sword and rifle however they are limited by the armor plate at the back of the hand. A masterpiece figure with this many sacrifices would be a tough pill to swallow if it wasn’t for the final combined mode. Saber’s Robot mode takes a lot of hits and in all honesty is probably the worst part of this package for me. I’m a big fan of the aesthetic of Victory and the way Saber looked without his armor and while this figure makes for a decent shelf toy he’s a real pain to play with or try to pose in any meaningful way. His jet mode is solid but his robot mode leaves quite a bit to be desired. Luckily the combined robot mode makes up for it and leaves me still feeling quite satisfied with the package. 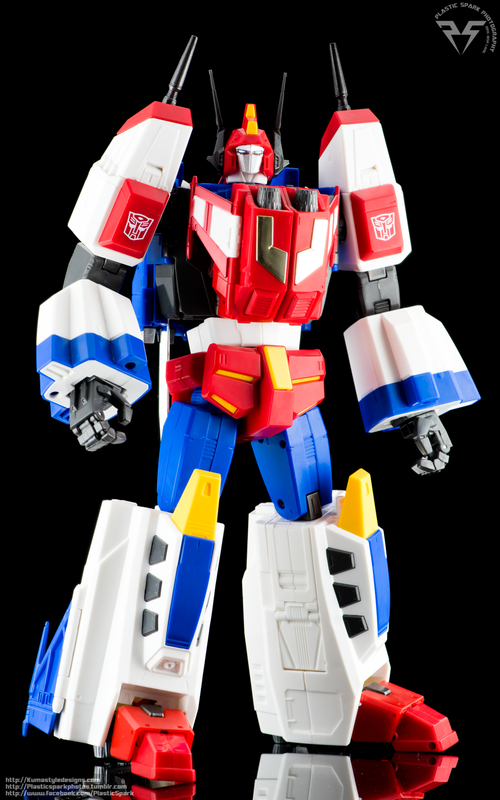 One of the most immediate things you will notice about Star Saber…is that he doesn’t look like a Transformer right away. He shares a lot of design aesthetics with Gundam and Japanese Super Robot Anime. He’s just a yellow V fin on his forehead away from full on UC goodness. His color palette is the traditional heroic mecha scheme of red white and blue with a little bit of yellow, pretty much the same palette of most “Hero” Gundams and many Transformers as well. He is a large and intimidating figure standing taller than MP10 Optimus Prime and MP22 Ultra Magnus on a display shelf and with his Saber Blade in hand he looks ready to strike down any Decepticon evildoer. The V-Star helmet slides over Saber’s robot mode head and through clever use of different hinges and joints still allows him to look left and right, and up and down to a certain point. It’s not as versatile as a ball joint but not much different than the traditional 2 axis articulation you’ve come to expect for Masterpiece Transformers. Considering the gimmick of the Brainmaster, and then a helmet on top of it, I’m just amazed he has any articulation at all. 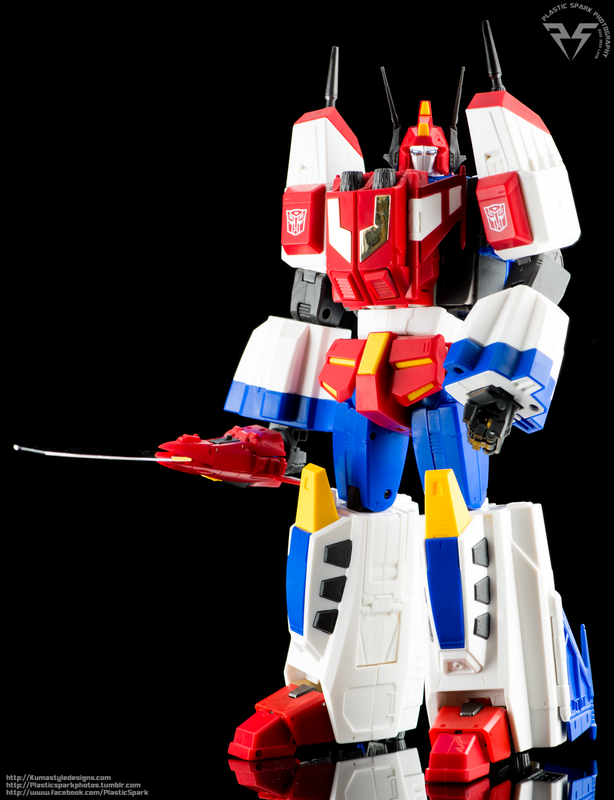 Star Saber has an interesting range of articulation and dedicated joints in his arms to allow for a variety of sword wielding poses including the ability to cross his arms over his chest to allow for a 2 handed sword pose. His shoulders can unclick from the main body on a swinging hinge to allow for the cross over motion, as well he has a dedicated swinging hinge where the bicep swivel is that allows for the arms to bend outwards to enhance the limited outward range of his shoulders. 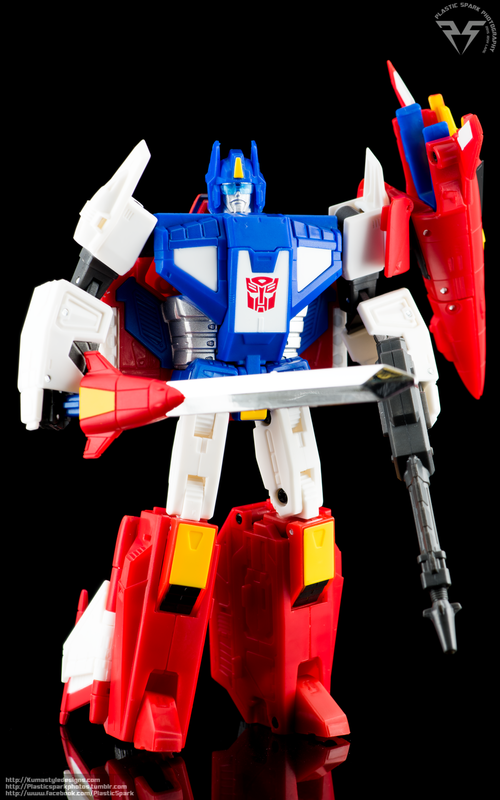 This can allow for Star Saber to hold his sword out at an angle without his shoulder pylons threatening to rip his helmet off his head. He has a 1 click forward ab crunch as well that can add a nice dynamic feeling to his combat poses or allow for a more natural posture when looking down at smaller characters. He has a slight waist swivel as well as a slight side to side rocker at the waist to further increase the subtle posability of his torso. He has double jointed elbows but due to the large forearm chunks and his shoulder armor you can’t bring his arms full up flat to his bicep but you do get a natural range of motion that looks good without looking like he is breaking something to curl his arms. His hands are the typical masterpiece style we’ve gotten used to; articulated fists with a separate joint for the trigger finger. His hands are massive, similar to MP22 Ultra Magnus and I feel at this size there was definitely room for some added articulation. 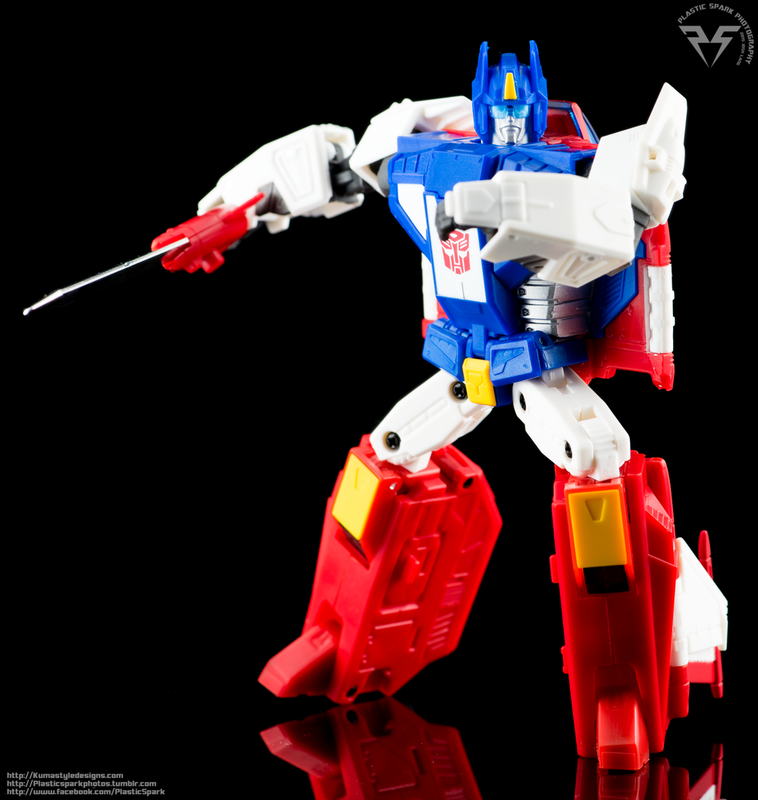 KFC makes some third party hand kits for Star Saber that I am interested in trying out as the ability to have him pointing, or with splayed fingers I feel would really add to some of his posing options to make them look more dynamic and have a little more heroic flare. Legs are fairly standard at this point, he’s got 2 way ratchet joints in his hips that can limit his stances a bit. For a larger figure I can understand why they would skip ball joints in favor of the ratchet but unfortunately it really leaves you with very little “fine tuning” of the legs posture. 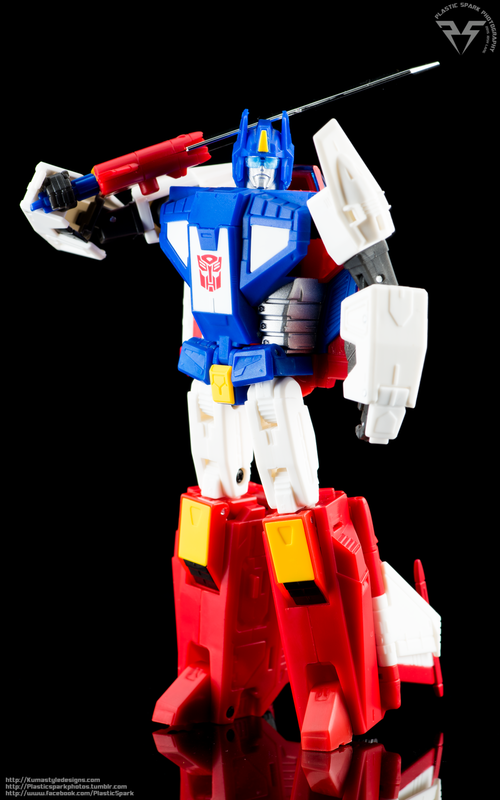 My copy of Star Saber actually came out of the box with one of his hip ratchets not functioning, this would cause one of his legs to slip out from under him and he would fall down on glossy surfaces. Luckily it was just a matter of tightening up the screw holding his leg together to grip the ratchet better. His feet do swivel and tilt but due to the large housing around them the articulation is actually quite limited and a bit less than satisfactory. He has large chunks of die cast metal in his feet and lower legs so he’s fairly stable though some of his parts are just a smidge too heavy for his joint tolerances. This can lead to issues trying to pose him with his sword and arm outstretched or when trying to get a dynamic wide stance with his legs. He’s capable of a good number of poses without overstretching his engineering limits but he does have some obvious limitations that may turn you off if you like to achieve crazy poses with your toys. 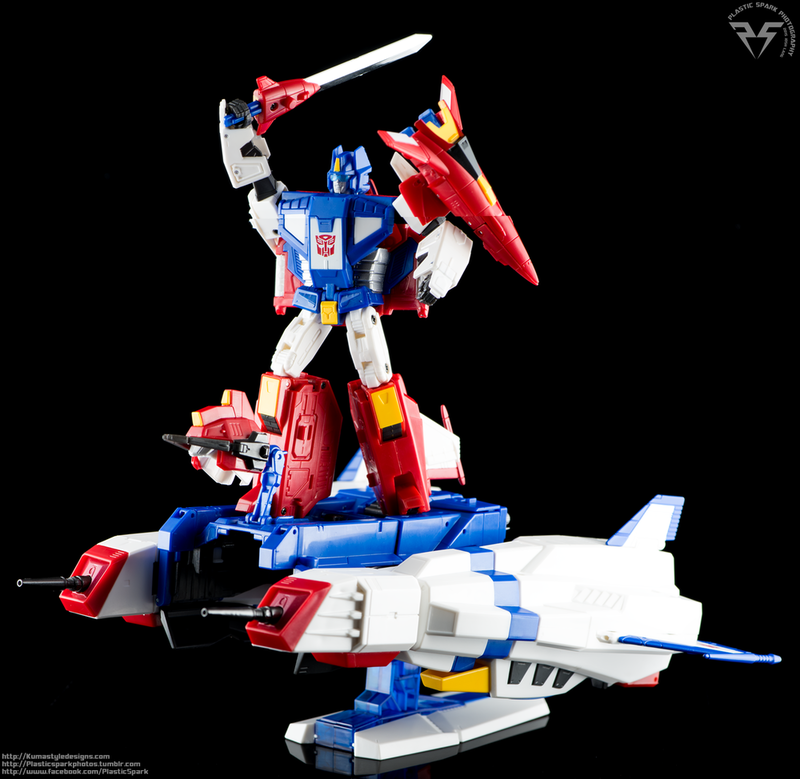 Star Saber comes with a nice handful of accessories. 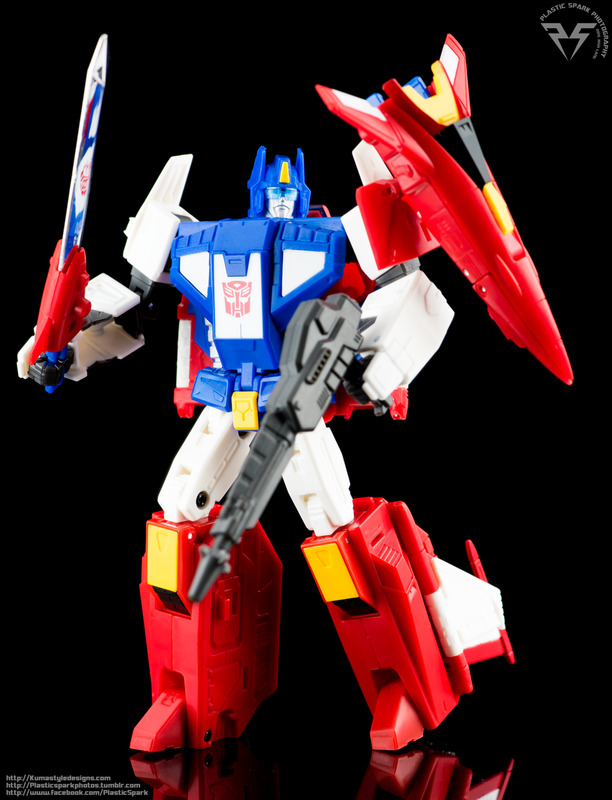 He comes with 2 chromed sword blades, one smaller for Saber, on larger for Star Saber as well as a removable hilt for the smaller blade. The nose cone / shoulder shield from Saber detaches and the tip splits to allow the larger blade to be pegged in to form the full Saber Blade. 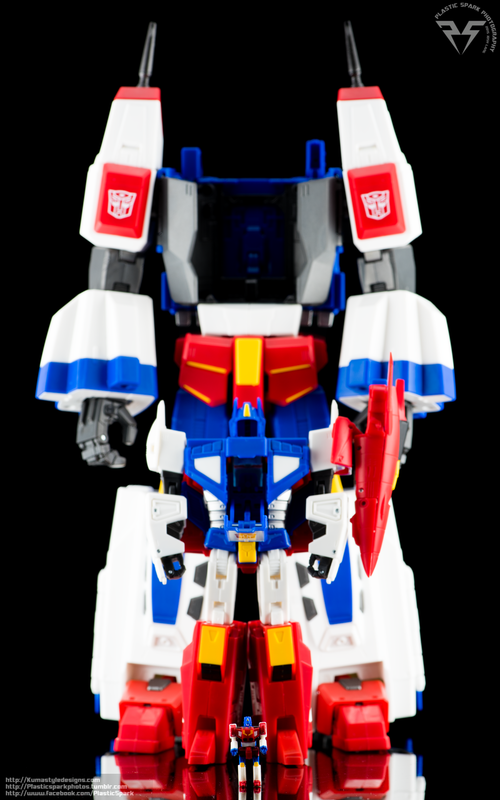 Both blades can be stored in slots behind Star Saber’s shoulders under hinged covers. A major bonus is that the blades can stay stored in all modes and through transformation without the need to be removed. The “Saber Laser” rifle is included and can be used with Saber or the combined mode Star Saber though in a strange circumstance it is simultaneously too big for Saber, and too small for the combined Star Saber. It can fit in either ones hand and looks like a functional blaster but the size is just a little bit distracting in either mode. 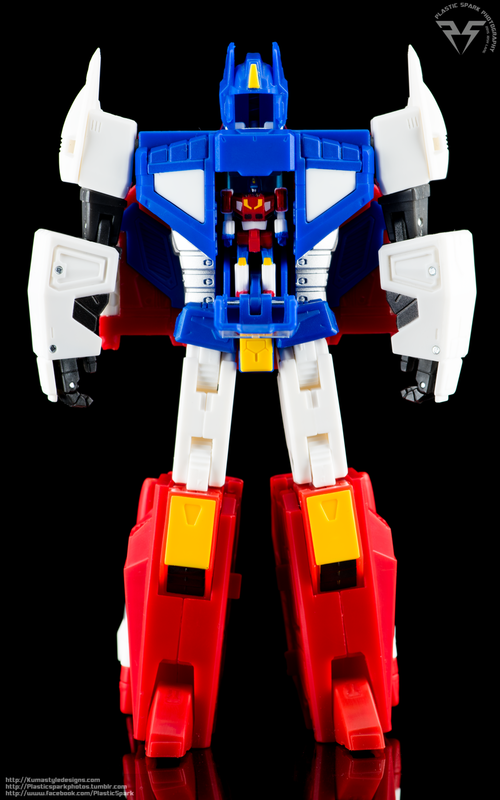 A large white Shield is included that can be wielded by Star Saber in either of his hands, the shield was not part of the original G1 toy however it was featured in only one episode of Victory. If I remember correctly Star Saber pulled it out to deflect a blast and then promptly threw it to the side to continue battling. The center crest of the shield can be removed and replaced with a translucent blue plastic piece to create the flight stand for alt mode. He also comes with a replacement handle for the Saber Blade to allow for a 2 handed grip. The handle attaches to the original while it is still folded within the nose cone piece and does an adequate job. The plastic is a little thin and it does feel a bit fragile for how long it is so I would recommend to be careful. This is the only thing in this entire box that feels fragile though so I'd say that's pretty good for a Masterpiece figure. One accessory I wish it included is a helmet for the combined mode that looks like Saber’s normal head. In the Victory cartoon he is constantly portrayed walking around the base or in non-combat situations in combined mode but without his battle helmet on. While this effect can be achieved by leaving his helmet off the Saber head is much too small and looks kind of silly. MP-24 Masterpiece Star Saber is a unique piece. While he is a significant entry in the history of G1, he is easily overlooked by anyone who hasn’t watched the Japanese G1 series, or didn’t enjoy it. Personally I’m a big fan of Headmasters, Masterforce, and Victory so the addition of Star Saber to my Masterpiece collection was a no brainer. If you don’t have this toy and you think it might be something you are interested in, I would urge you to try and get some hands on time with one. The best part of this figure for me is something that I can’t express in photographs. The feeling of this toy in my hands, the smile I get on my face combining him and transforming him really can’t be expressed. He’s a big, chunky, heavy toy like the figures I remember from my childhood and I don’t feel scared to play with him at all. The only figure I can remember ever being this content with was Optimal Optimus, near the end of the Beast Wars line. He was a massive and heavy toy that had basic to advanced articulation and was satisfying to own and sit down with despite the lack of anything really groundbreaking. One of the best things the design team did, and this was done on purpose according to Hisashi Yuki, the lead designer for MP24 Star Saber, is to avoid using paint as much as possible and try to make every piece out of molded plastic on the correct colors. While there is some paint on the figure the majority of it is molded in the colors needed and as such there is next to no risk of scratching the paint when playing with him. 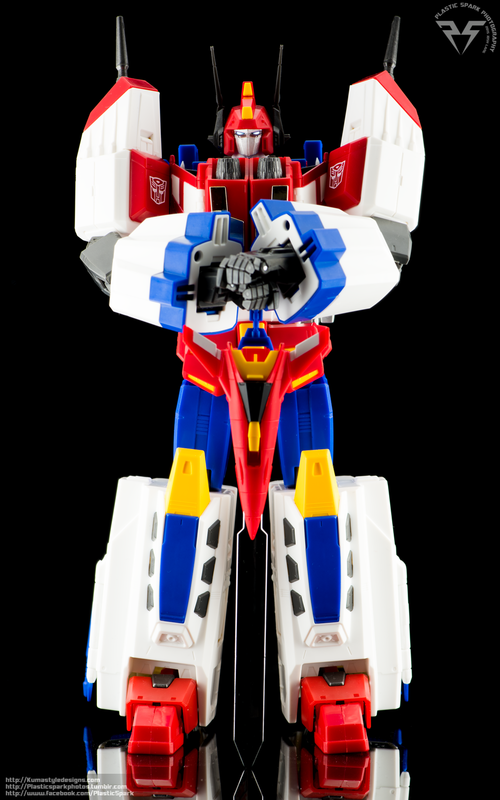 Yuki wanted people to be able to play with MP Star Saber, since the original toy is something of a holy grail to collectors and the idea of anyone flying him around their room to blast Decepticons would make most collectors double check the locks to their bedroom.